On some Lake Superior Tours in the Upper Peninsula, we traveled west to east, ending up in Sault Sainte Marie, Michigan. On other trips around the Lake SuperiorLater, we had an opportunity to reverse that route, entering the Soo from Canada and then going west across the UP. 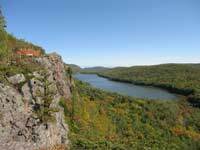 See Ski and Snowmobile Trail Report Links here. The "Soo" is most popular for visiting the impressive Soo Locks, seeing the big ships come through up close, and seeing all the exhibits in the Soo Visitor Center. 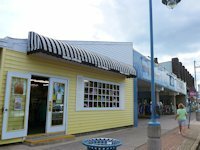 The shops along the main drag (Portage Ave) adjacent to the river are also fun to visit. If you are headed west on the Circle Tour from the "Soo" you go south on I75 to the intersection with Michigan 28 west. After a short drive look for the turnoff north to Brimley. 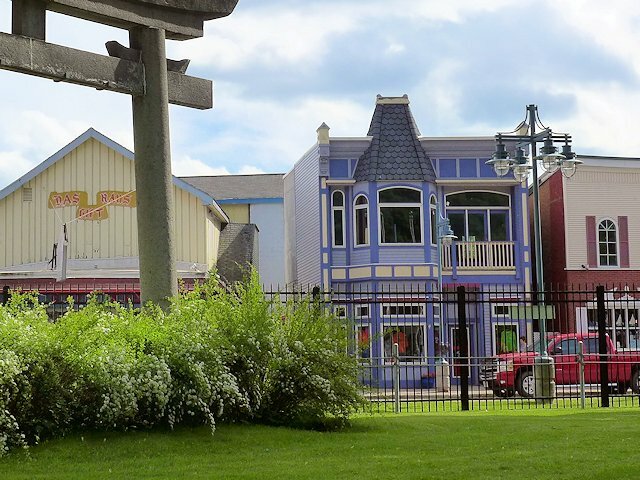 Then in Brimley, continue west on Lake Shore Drive through the Bay Mills community. We've previously stopped for dinner at Bay Mills Resort & Casino. Decent price for the meal; service could use improvement - but they were busy. The Casino also has an RV park. They also have a great golf course (Wild Bluff) with decent prices and you get a discount if staying at the RV park or the casino. Lake Shore Drive eventually leaves the lakeshore and morphs into Curley Lewis Highway. It ends at Highway 123, which you should take north towards Emerson and Paradise. 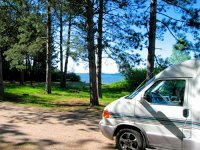 At Emerson is the Riverside Mouth campground unit of Tahquamenon Falls state park. Highway 123 stays within view of the lake until you get to Paradise, a community with a number of craft shops, including a quilt shop - which made it a required stop for us. Beyond Paradise, the road continues north until it ends at Whitefish Point lighthouse and Bird Observatory, a worthwhile slight detour from the Lake Superior Circle Route. 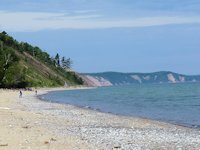 When you return from visiting Whitefish Point, go west from Paradise on Highway 123 toward Tahquamenon Falls, an important must-see attraction in the Upper Peninsula. Get Acquainted with Current Passport Regulations - Be aware of requirements for motor travel between the United States and Canada. 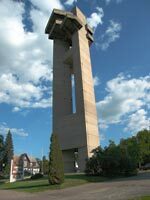 The 210 feet tall Tower of History has a history museum on the lower level with exhibits and a video presentation of European and Native American history of the Sault Ste. Marie region. The upper level, in addition to a panaromic view of the Soo Locks, St. Mary's River, and the countryside, has additional exhibits. The Michigan side of the "Soo" is best known for the Soo Locks that handle the biggest freighters going between Lake Superior and Lake Huron. There's a riverside park with an observation deck that allows the visitor to get an upclose view of the big ships and how the locks work. A must-see stop while in Sault Sainte Marie, Michigan or traveling through the community. See our web page on Visiting the Soo Locks. Here's some shots looking east from the bridge between the two "Soos." The shot on the left shows one of the power generation dams on the American side. The shot on the right shows the southern part of St. Mary's Island - which is on the Canadian side. One of the fun places to stop in Sault Saint Marie, Michigan is The Antlers, a bar and restaurant on Portage Ave. near the Soo Locks Boat Tours dock. As the name suggests it's rafters and walls are filled with antlers and you are surrounded by all sorts of other wild things. 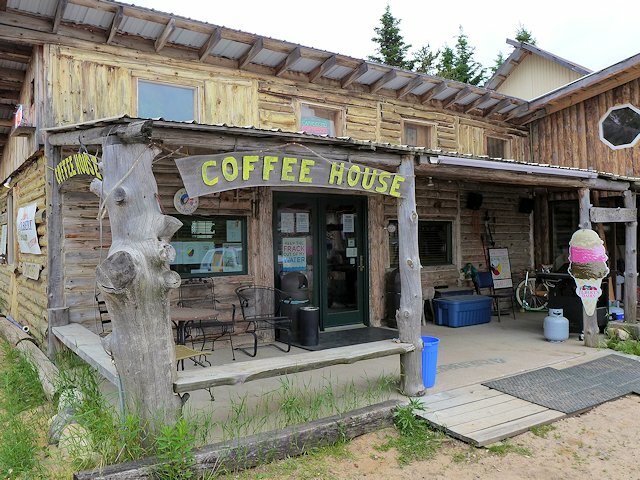 In Brimley, about a mile north of the Bay Mills Casino, is a cute log cabin coffee house that also offers sandwiches, ice cream, comfortable seating, friendly service, and a gift shop. A few miles west of Brimley, along the Whitefish Bay Scenic Byway, is the restored Point Iroguois Lighthouse and Museum. There's also a nice little nature trail that runs out to the point and back plus a set of wash rooms making this an attractive rest stop area. See more here. On the way to Tahquamenon Falls, if you have time take a side trip north to Whitefish Point Lighthouse. First activated in 1861, it continues in operation today - although in an automated version of its earlier self. Lighthouse tours are available. We also enjoyed walking the nearby beach. 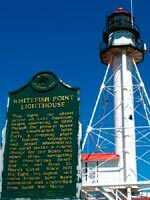 Whitefish Point Bird Observatory, is also located here at the northeastern tip of Michigan's Upper Peninsula, "Whitefish Point is a phenomenal concentration spot for migrating raptors, waterbirds, and song birds." A required stop whenever we are passing through the small town of Paradise is Village Fabrics & Crafts so Joanne can browse their quilting fabrics. Go here for a listing of more Quilt Shops around Lake Superior. 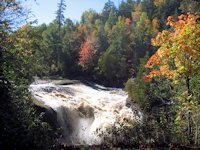 Next Stop on your Lake Superior Circle Route tour should be Tahquamenon Falls State Park to see the waterfalls, the park, and the interesting brewery in the middle of the woods. The Great Tugboat Race - ?